1. in fashion; up to date. Look at you! You're here, and that makes me happy! In case you haven't guessed by now, my name is Annie. I started this little blog after graduating from culinary school in 2012 as a way to document and share my personal recipes, attempts at being fashionable, restaurant tastings, and sometimes pointless ramblings. Years later, what started as The Nifty Cupcake has now transformed into Annie à la mode to better represent a wider range of content. As you can see, the term à la mode can mean 'in fashion' or 'served with ice cream' - I am fine with either scenario. I was born a Southern gal, but could never get the hang of saying "ya'll" and I am not a fan of grits OR sweet tea so they pretty much kicked me out. This past year I was lucky enough to chase my dream of switching coasts and am now proud to call Portland OR home. You can easily find me at any local coffee shop, enjoying some grub at a food truck, or hiking around Multnomah Falls. 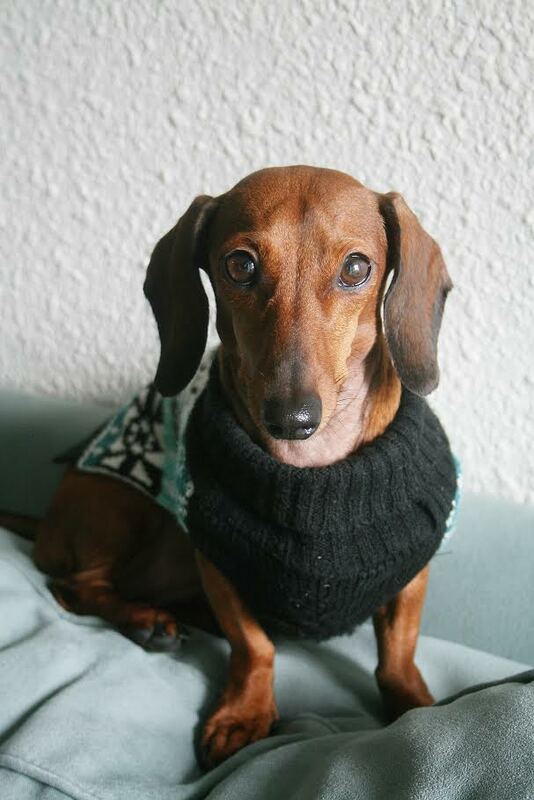 This is Beanie The Weenie - she enjoys long walks, licking spoons, and wearing cozy sweaters. You'll see her pop up on here from time to time. What's up with those photos? I typically shoot with my Canon Rebel xti, 55mm lens. Sometimes you'll catch me with my Konica FS-1 film camera which is the original camera I learned to shoot on. I try to keep editing to a minimum and only occasionally sharpen up an image using a free editing system that came with my camera. So you have a culinary degree eh? Yep, I have two associates degrees, an A.S. in Culinary Management and an A.A. in Business. I am currently working on (I finally graduated YAY) my Bachelors in Supervision and Management which will be my LAST degree. Unfortunately no (but a gal can dream). I blog when I have time (and enough daylight) and work at a local social media/marketing company by day! I noticed that a lot of your recipes are meat free, are you a vegetarian? Sort of. I have been a pescatarian (the only meat I eat is fish) for at least 10 years now. Whenever I post a meat recipe on here it's for my family to eat. I decided to drop meat due to intestinal issues plus I just wanted to live a more healthy lifestyle. I am totally obsessed with marzipan, I also like fruit based desserts and tiramisu! Can I use your pictures/recipes on my site? Thanks and of course you can, just make sure you provide a linkback to Annie à la Mode and give credit where credit is due.